It's hard to read, but the destination sign on this bus reads "C92 Bridgeport Stn". Thanks to TransLink’s ongoing service optimization, the service changes for the fall are quite modest compared to previous years. This year, they mainly involve frequency changes. One significant update is the change in route number for the Fraser Heights route from C74 back to 337. In addition, a few routes will be using Community Shuttle vehicles during periods of light use, such as in the evenings, or in the case of the peak-period 388, at all times. When the Community Shuttles were introduced, routes that used them were given numbers that had a “C” prefix. Over time, the distinction between using a shuttle and having a “C” route number diminished greatly. When the old 337 was converted to the C74 in 2004 [PDF], demand on the route remained so high that conventional buses were soon brought back during times of heavy use. 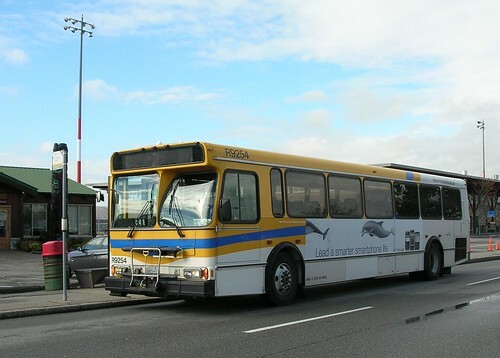 Even now, the resurrected 337 will use conventional buses during weekdays, but have the shuttles serving Fraser Heights on weekends.